FOX HAUNTS is ready to trot! FOX HAUNTS isn’t officially out till September, but foxes are sly and appear unexpectedly, those tricksters. Here’s a delicious first review by poet Stanley Fefferman: http://opusonereview.com/?p=4769! Penn Kemp. Fox Haunts. Aeolus House, 2018. 97 pp. as beguiling women with red in their hair. 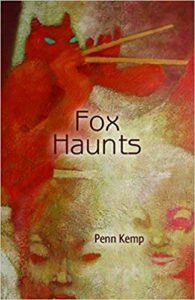 Fox Haunts, Penn Kemp’s 24th collection, is a meditation in 90 poems on a predator who is our closest neighbour, one who is getting closer all the time as it’s habitat yields to subdivisions. The longest section of Fox Haunts, entitled “Urban Fox,” consists of poems about foxes Kemp might have encountered: her writing can be elegant. like a ballerina of the wildwood. Kemp empathizes with the drama of the hunt, the inside as well as the outside of it. this compliance in the fox’s grasp. Kemp is ‘entranced’ with the world of “Wily wiry trickster tales,” and devotes a section to ‘Fox’ references in the writings of Taliesin, Ovid, in the legend of Samson, in other Hebrew Scriptures relating to Solomon and Ezekiel, in Aesop, W.B Yeats and St. Exupéry, Akiro Kurosawa and Alice Munro whose father raised foxes for fur on a farm where he also kept ” Old horses in the barn waiting/their turn to be fed, to be feed.” As for the night sky, Kemp puts fox in the constellation Canis Major and Canis Minor, These bits of Fox arcana bring into close focus the mythical resonance of that beast in the human imagination. she chases. Let her seize that Teumessian fox! Fox Haunts is one those rare books that can become a companion. I’ll be launching FOX HAUNTS on September 9, 2018, 4-6 pm. Launch, Aeolus House poets: Ariane Blackman, Brian Cameron, Stanley Fefferman, Tom Hamilton, Penn Kemp and Colin Morton. Pressed (waffle house), 750 Gladstone Ave, Ottawa, ON K1R 6X5. (613) 680-9294. Contact: Allan, abriesmaster@outlook.com. Sunday, Wednesday, Sept. 12, 7-9 pm. Launch, Aeolus House poets: Ariane Blackman, Brian Cameron, Tom Hamilton, Penn Kemp and Sydney White. Supermarket Restaurant, 268 Augusta Ave., Toronto. Contact: Allan, abriesmaster@outlook.com.